Perhaps you received a promotion or found a new job and need to change your location for a long period of time. If you are looking for moving companies to help as an expat with your international move, we offer you free moving quotes on this website. With Intlmovers you will receive free quotes for your international move. Searching for international movers with Intlmovers saves expats time and money. Wherever you move from and to as an expat, using this site you can find the appropriate company to help you move. Simply fill in the form with specific information about your move and companies will receive your request and contact you directly. Choose the best company for your move! This quote comparison service is absolutely free! People who move temporary or permanently to another country of different culture for the purpose of either business or personal purposes or for the reason to change your life and try something new are known as expats or expatriates. The term expat is mostly used for professionals and highly skilled people that are sent abroad by their companies. The average time for an expat sent abroad depends, but averages between one and three years. As an expat you have to organize a lot of things. 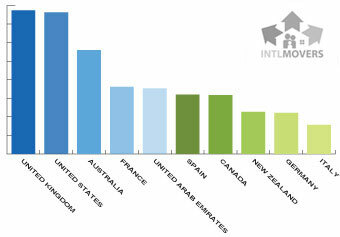 Intlmovers can help expats with their international move. 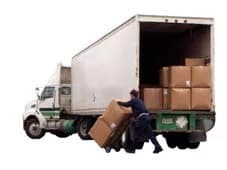 You can request up to six quotes and compare them by service and price for your move. The most popular destinations are mentioned below. The top 10 countries are: United Kingdom, United States, Australia, France, United Arab Emirates, Spain, Canada, New Zeeland, Germany and Italy. Many expats prefer to move to the UK as it is a country with a well developed economy. It is known for its business and education opportunities and high level of social security. When you are choosing the country that you wish to move to, knowledge of the local language plays one of the most important roles. With English as its official language, most expats find it easy to settle in the UK. Visiting or working in the UK does not require a visa if you are an expat from a country of the European Economic Area and Switzerland. If you are an expat from US, Australia or Canada, you do not need a visa for staying in the country for a period of up to six months. The same rules apply for many South American and Caribbean countries, as well as Japan. With work permits, there are two types: Tier 1 is for skilled workers who do not require an employer to sponsor them. Tier 2 needs a Certificate of Sponsorship. The most popular destinations for expats in the UK are mainly the big cities such as London, Edinburgh, Glasgow, Belfast, Cardiff, Birmingham and Manchester. The UK has the seventh place ranking in ease to do business. It has the highest ranking of getting credit, which is important when starting your new life in a new country. There are many job opportunities in the UK, and the demand for the following roles is expected to increase: managers and senior officials, personal service job, retail sales and entry level positions in a number of industries. The average prices in the UK are generally considered higher than in many other countries. However, salaries are also higher to help compensate. The USA is one of the most attractive countries for expats. The country is a world leader in economic development and the largest center of political, financial and scientific activities. A well developed organization of interaction of all state institutions is aimed at strengthening the country’s growth and welfare. The social security is well developed in the country. All citizens and expats, who have residence permits (the so-called green card) become participants in a well-functioning and efficient social security system. Going to the US with the aim of working, a working permit is required. There are several types of working permits in the US, depending on time frame and the type of employment (self or sponsored). There is also a Green Card which grants permanent residency in the USA. It allows you to live and work in the USA. The USA is proud of its education system, especially universities, which are known all over the world. These include Yale University, Harvard University, Princeton University, Stanford University, Massachusetts Institute of Technology (MIT) and others. Commonly people considering a move to the US to live and work, choose the biger cities such as New York, Los Angeles, Chicago and Washington where many enterprises are located. Australia is one of the most developed countries in the world. In 2011, it took fourth place for quality of life. This ranking takes in to account average incomes and salaries, housing prices and social terms. It attracts expats from different part of the world by its mild climate and soft immigration laws, which kindly welcomes experienced specialists and businessmen. On this continent there are white sandy beaches surrounded by ocean and coral reefs, tropical jungles and deserts. All these factors combined make Australia very attractive for expats. All expats who come to Australia need a visa. The only exemption are the residents of New Zealand, but they do require a special visa. There are many types of visas, which varies depending on the purpose and period of stay. There are visas for workers, migrants, visitors and students. Each of the mentioned categories has subcategories. As with any visa requirements, it is always recommended that you to visit the official website of the Australian Government, Department of Immigration and Citizenship. Australia takes 15th place out of 183 countries in regards to the ease of doing business. Moving to Australia, many expats settle in larger cities as there are generally more opportunities for building a career. The major cities in Australia are Canberra, Sydney, Melbourne and Brisbane. The most in demand jobs are business analysts, project managers, recruitment consultants and business development managers. English is the official language and therefore many people find it easy to move here and find a job. Taxes in Australia are lower than (for example) the UK. Many people move to Australia because of the mild climate, which provides on average around 300 sunny days per year. Australia has a rich and diverse nature and a good ecological environment. Wherever you want to move as an expat, you will find the right company for your move on Intlmovers. On this website are specialists in international moving who have many years of trusted experience in the field. Finding companies for your international move is easy and quick with Intlmovers. Fill out the request form which will be sent to up to 6 companies. They will contact you directly to offer their prices and services. Choose the one that best meets your needs! The service is totally free!